Matthew Byram of Greenville makes his donation to members of the Darke County Friends of the Shelter and Darke County Shelter staff. GREENVILLE – While many children have a traditional birthday party, 9-year-old Matthew Byram of Greenville decided he would like to do something else. Matthew and his mother, Susie, take their dog, Sophie, to Scentral Park Dog Park regularly. He decided he would like to do something to benefit the dog park. He asked that his friends bring monetary donations to his party instead of gifts. 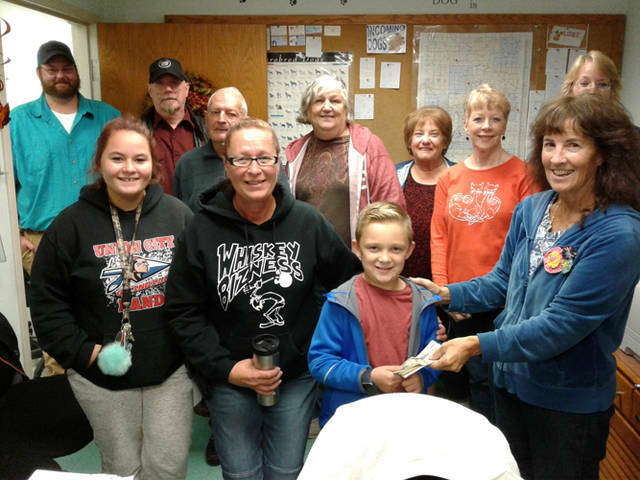 The Darke County Friends of the Shelter thanked Matthew for his thoughtful gift in support of Scentral Park. His donation will be used for the upkeep of the dog park for all to enjoy. The Darke County Friends of the Shelter is a 501 (c) 3 non profit organization that raises funds to provide extra goods, services, comforts and amenities to benefit the shelter and maintain Scentral Park Dog Park. Scentral Park was built and is maintained through donations only. No tax money is ever used. The Darke County Animal Shelter and Scentral Park Dog Park are located at 5066 County Home Road, Greenville.